Transparent electrodes might sound like a bit of high-tech machinery, but they’re the basic components of many electronic screens, from cell phones to solar panels. And there’s money to be made in making better versions of these everyday conductive coatings. This week, a startup that spun out of Stanford University, C3Nano, says it has raised its first round of funding to move closer to commercialization of its transparent electrodes that it says are lower cost, more flexible and lighter weight than conventional materials. Year-old C3Nano was spun out of the chemical engineering labs of Stanford Professor Zhenan Bao last year and has now raised a $3.2 million Series A round from GSR Ventures, a firm that specializes in investing in Chinese tech companies. 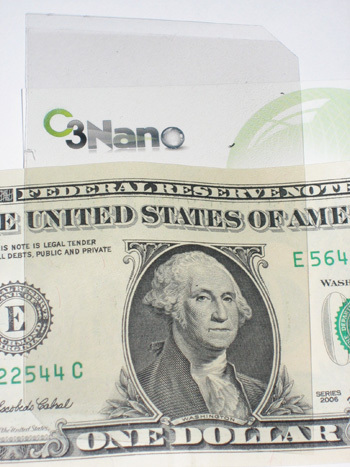 Last May, C3Nano also won the $200,000 grand prize in the 2010 MIT Clean Energy Prize contest. Making a dent in ITO could be a potentially massive market. As the co-founder and former CEO of C3Nano, Jeff Sabados, explained to us in an interview last year, ”An average person probably looks at a transparent electrode 12 hours a day.” Add to that the growing solar photovoltaic panel market (Clifford Morris is now C3Nano CE). For solar PV, Sabados told us that C3Nano’s coating will increase the efficiency of thin-film solar panels by more than 1 percent. With state-of-the-art solar panels today, about 20 percent of the sunlight is “absorbed, lost in the transparent electrode,” when it hits a solar panel, but C3Nano aims to reduce the amount of “lost” electrons, allowing up to 12 percent more sunlight to penetrate. C3Nano isn’t the first to work on carbon nanotube-based coatings for solar cells, and companies like Eikos have paved the way for C3Nano’s entry.